Rachel Zolf was commissioned by New York artist Josiah McElheny to write the script to a film based on German writer Paul Scheerbart’s short story The Light Club of Batavia: A Ladies’ Novelette (1912), a fantastical tale about a group of socialites who meet at a hotel in Batavia and decide to build a spa at the bottom of an abandoned mineshaft so that they can “bathe” in light. 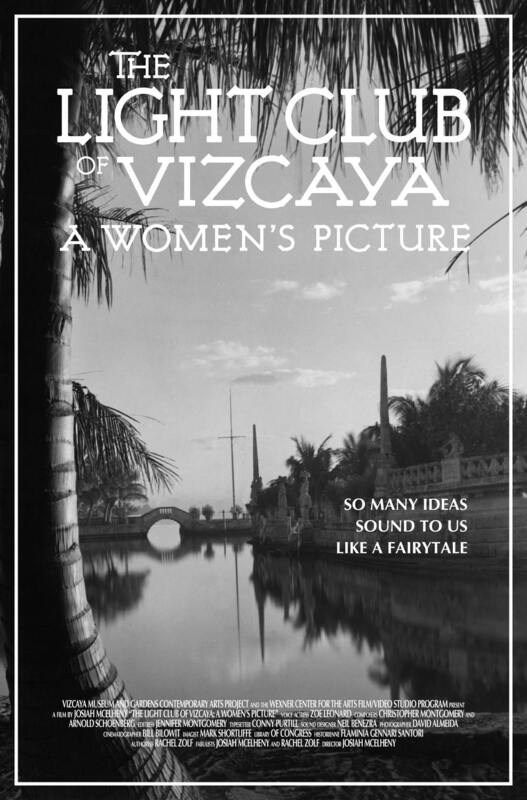 The Light Club of Vizcaya: A Women’s Picture translates the setting of the Scheerbart story to Vizcaya, the Miami winter home of Chicago industrialist James Deering. The film substitutes Scheerbart’s main characters with those who were involved in the making of Vizcaya and its history, and recreates a narrative about the promise of modernity and utopia. Re-staging the story in a different locale creates a story-within-a-story that playfully deals with themes of gender, sexuality, society and nature. Presenting an alternative view of Modernism, as experienced by a lesbian protagonist, the work deals with Scheerbart’s notion of universalist politics as a wholly other possible path of history. It proposes that Modernism might have been redirected from efficiency and restraint to expand the concept of the human. Artist Zoe Leonard narrates the film. The Light Club of Vizcaya has screened at White Cube Bermondsey (London, UK), Art Basel Miami Beach, the Wexner Center for the Arts, the Arts Club of Chicago, Centre de Cultura Contemporània de Barcelona (Spain), SBC Galerie D’Art Contemporain/Gallery of Contemporary Art (Montreal), and Anthology Film Archives (New York). Subtitled in Spanish and Catalan. Screenplay published in Wexner catalogue Josiah McElheny: Towards a Light Club (Hatje Cantz) and in Tripwire.